It’s simple. 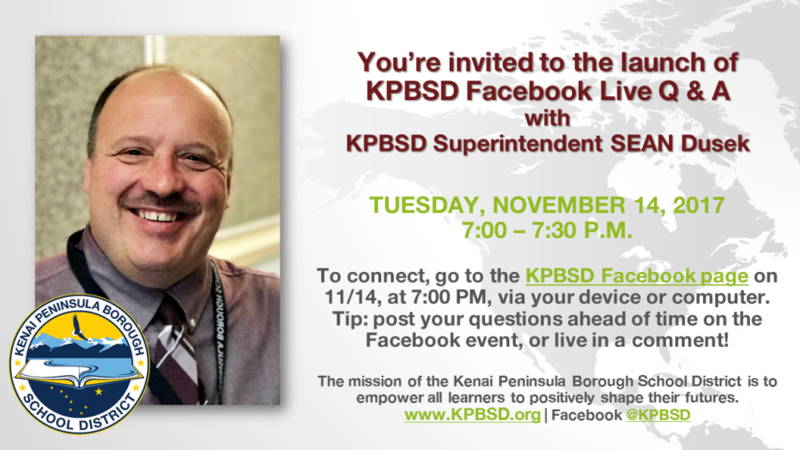 Go to the KPBSD Facebook page on 11/14/17, at 7:00 PM, via your device or computer, and connect! You’ll see that KPBSD is live – click to view. Viewers type comments into the feed below the video. KPBSD does not “see” viewers via videoconferencing, this is a one way video view feed from KPBSD. Interaction happens via comments and post likes or emojis. Everyone is invited to tune in – KPBSD parents and students, staff, community members, KPBSD partners, and KPBSD Key Communicators. Afterwards, the Q&A will be saved as a video to review at your convenience. This Facebook live event is the first in a series to expand the KPBSD Key Communicator program, engaging our people and publics with conversation, and offering accurate stories, information, and responses to questions about the KPBSD. Please join in, and offer your thoughts and ideas. You don’t need a Facebook account to watch live. This entry was posted on November 13, 2017 at 10:07 am. You can follow any responses to this entry through the RSS 2.0 feed. You can leave a response, or trackback from your own site.